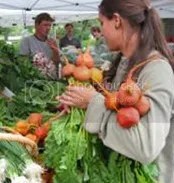 “I’d like to buy organic vegetables, but they’re so expensive.” Ever catch yourself dreaming of more affordable organics? Try this on for size: What if, every time you purchased an organic vegetable, you actually got not just one but two or three vegetables? No doubt that would make the economic equation a lot more attractive. the following day the beet stems went into a lentil soup. In other words, that’s four meals’ worth of vegetables for $4.00, or $1.00 per meal for amazingly delicious, don’t-harm-the-environment, don’t-harm-me, super-nutritious vegetables. 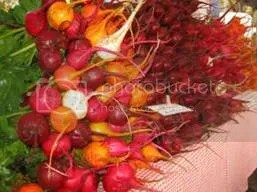 Bear in mind, too, that this was no ordinary bunch of limp beets with scraggly tops. They were firm and dense, the tops lush and huge and the stems plentiful. Every part of the beet was rich with flavor–leaving the taste buds completely satisfied and providing plenty of vegetable nutrition. Could anyone really argue that $1.00 per meal is “too expensive” for this caliber of vegetable? “You get what you pay for” is a universal law. Pay little and you get little. Happily, it works the other way, too, however. Pay a fair price and you get a fair–often more than fair–product.